Creativity has pretty much always been at the core of audiovisual solutions, but recent industry trends have presented an interesting divergence. In the enterprise and education verticals most notably, there have been distinct moves to standardization and repetition, which some veterans have struggled to adapt to and remove the artistry from the highly custom nature that was traditionally a selling point. To this, I’d counter that even in the face of repetition in systems designs, there is still plenty of value in employing creative strategies, just in a different application. InfoComm of course has been championing this concept through its exceptional experience campaign the past few years, leading a shift in the presentation of AV services. They’ve continued this push at this year’s show with the TIDE conference and Center Stage presentations. Beyond the corporate and classroom demands, a few newer areas of opportunity have emerged in providing entertainment spaces, beyond the traditional performance arts venues. Big name brands and institutions are putting big dollars into creating multimedia experiences for marketing campaigns, attracting young hearts and minds. Millennials are proving that they are eager to be drawn back into physical spaces, lured by the possibilities that digital technologies can create only in person. With all of these developments in mind, we present this year’s installment of The Nine—experience design companies that AV integrators need to know. We’ve chosen to profile these cutting edge experiential technology firms briefly in words, emphasizing the project images because, as we all know, seeing tells the story much better. Why You Need to Know Them: Technical meets physical in the Deeplocal innovation studio, where the sound of power tools intermingles with talk amongst engineers of the mechanical, electrical, robotic, and software variety. Spun off from Carnegie Mellon’s STUDIO for Creative Inquiry, this firm translates intangibles into objects and makes what was once digital more palpable in the real world. Hacker roots and a knack for interpreting the impossible as just a schematic away from reality have endeared Deeplocal to mega advertising agencies looking to deliver an experience instead of just another commercial. Their partnerships result in visually and tactilely redolent works, such as the first implementation of Google Creative Lab’s AnyPixel.js, for which Deeplocal helped to create an installation that used 5,880 off-the-shelf arcade buttons to create a sensational video display. Seriously, They… have patents and products, and can provide strategic data-driven guidance on connecting an audience with a brand through experience. Why You Need to Know Them: The built environment serves as wireframe to this multidisciplinary interpreter of spaces. Founded on the responsive multimedia environment visions of video game developers, Float4 produces site-specific multimedia installations informed by a broadly collaborative group of designers and makers. In cultivating custom interactive walls and digital experiences, the studio has developed a number of real-time data sharing mechanisms and other technological tools, including its proprietary RealMotion platform. From conception through to realization, the Float4 team collaborates with clients to elaborate on the architectural vision of their spaces. Seriously, They… attract and engage on a multitude of levels with tailor-made solutions that deliver differentiation to clients. Why You Need to Know Them: Extending the capabilities of the farthest-reaching technologies, Britelite Immersive builds from the edge where expected use becomes unanticipated potential. With immersive environments and interactive installations as baselines for building a story, this band of insiders cleanly connects all the much-hyped next-level tools in a transparent interpretation that makes experience all. The factual effects of motion capture, AR/VR, game design and gestural technologies become truly authentic and engaging storytelling occurrences in the hands and minds of Britelite Immersive. When playback and interaction becomes this seamless, it’s possible to persuade with more than techno marvel—these are stories come to life. Seriously, They… are working with culture-shifting brands on activations and content experiences that will soon be sought by many others looking to produce memorable impact. Why You Need to Know Them: A collaborative creative lab extension of AV Concepts founded by the team who began the holographic resurrection phenomenon when it gave Tupac a posthumous encore on stage at Coachella in 2012, Rezin8 rightfully declares that it can help brands and agencies produce unforgettable experiences. The creative approach taken by Rezin8 begins with a comprehensive cultural analysis of the client and the message they want to deliver. Then those perceptions are applied across an entire experience, immersing audiences not just with stagecraft, but also with a kind of mesmerizingly integrated full-platform expansion of imagery and sensation. Environmental and technical design chops meld with R&D prowess and content production capabilities to create experiences you have to feel to believe. Seriously, They… Use the word “disruptive,” and they mean it, wrapping an environment in a comprehensive storytelling spectacle. Why You Need to Know Them: Meticulously toiling away for nearly two decades in their artsy-scientist studio space in lower Manhattan, AV&C imaginatively melds design, engineering, and coding skills to create sumptuously memorable and evergreen implementations of media and technology. This team harks from the future, conforming previously untamable technology to enhance the built environment with thoughtful interactive, generative, and responsive systems. Their clients are big brands, star architects, museums, and highly individual artists, and their annual contributions to the Day for Night festival are jaw-droppingly gorgeous. Human factors here are not just ergonomic, they are emotionally immersive. Translating the experiential and interpretive across a broad range of retail, hospitality, corporate, data visualization, and location-based scenarios, AV&C will make you forget technology and just soak in the effects it can realize. Seriously, They… are building beyond shapes and media into the full sensory experience of moving images and light. Established: 1969 as Esslinger Design in Germany; 1984 rebranded as Frog Design in California. Why You Need to Know Them: The frog approach envisions a holistic ecosystem of brands, advancing the human experience of products and services spanning physical and digital perspectives. The unique heritage of frog traces back to electronics product design—the iconic Sony Walkman was one—and in the 80s, Steve Jobs ushered the firm’s arrival in California, resulting in Apple’s landmark Snow White design language, which resides in the permanent collection at the Whitney Museum of Art. Reimagining industries is a recurrent exercise for frog today. In a partnership with Intel, frog prototyped a digital signage system of interactive kiosks that enhance content in brick and mortar retail. The seven-foot touchscreens personalize shopping through wayfinding and engaging product context. The project highlights Intel’s high performance chips that conserve 70 percent more power to minimize costs and environmental footprints. Seriously, They… know how form follows emotion and use it to chart the future. Why You Need to Know Them: Awe-inspiring live spectaculars are the signature solution at TAIT, bringing artistic visions to larger than life manifestations. Founded as a rock n’ roll staging company while on tour with the band Yes, TAIT’s technical innovations have aligned with pop culture icons from Michael Jackson’s first moonwalk to Beyoncé’s elaborate Formation World Tour. Along the high-tech journey, TAIT constructed the first tracked LED video display debuted on Janet Jackson’s Velvet Rope Tour, and they’ve even gone to space with NASA and U2, designing elements for a video shoot on the Space Shuttle Endeavour. While the live event accolades continue to break barriers and receive recognition—most recently with the largest kinetic light display in touring history for the Red Hot Chili Peppers and being named as one of the Most Innovative Companies in Live Event by Fast Company—TAIT brings show-stopping expertise to permanent installations at the likes of Disney’s Global Theme Parks and Cirque du Soleil, among corporate events and brand activation. TAIT’s Navigator show control platform is the superhuman power behind the scene, enabling complex three dimensional flights and integrating I/O control for comprehensive, scalable automation. Seriously, They… amplify the visual senses by reaching out and transforming the audience’s experience. Why You Need to Know Them: The creative bounds may have no limits at Moment Factory, but they converge on destinations for the noble purpose of entertainment—be it at a concert, a retail store, or public space—inspiring wonder and connection. Their unique turnkey process bridges the disciplines of content, scenography, and systems to mediate between the digital and physical environments. In a world where mobile devices have led social venues to intangible spaces, Moment Factory functions upon the vital need to bring people together physically, through pioneering multimedia creations. 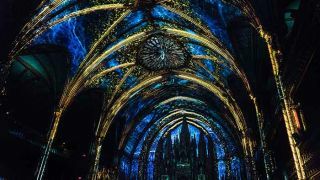 AURA is one recent example that went public at the Notre-Dame Basilica of Montreal, an immersive display bridging the city’s architectural heritage with the future. The AURA experience lights a path drawing visitors into the Basilica where they are bathed in projection mapped images, lasers, and sounds. Seriously, They… have a beta lab where they incubate quirky animations, touch design, 3D mapping, and everything else within the realm of creative exploration. Why You Need to Know Them: Intersection partners with brands in the explicit purpose of urban renewal—using technology to solve problems that cities face—to enrich the way people live. Perhaps the biggest demonstration of this mission in action is the LinkNYC program, a network of digital kiosks delivering free 1 gigabit encrypted Wi-Fi, access to city services, maps, free phone calls, USB charging ports, and various other apps and services rolling out on an ongoing basis the next several years. The beta program constantly receives feedback to further customize the experience. Ultimately, LinkNYC not only provides New Yorkers with super fast free Wi-Fi for the masses, but it gives the city the ability to participate in the digital economy and monetize assets with DOOH advertising. At least 7,500 Link kiosks will be installed across all five boroughs over eight years. As of press time, the count stood at 718 active Links with another 153 installed, awaiting connection. Seriously, They… use beacons and geo-fencing, and have thus carved out a space as a leader in integrating mobile out of home advertising solutions.